This title was first published in 2000. Recent years have seen tremendous economic and political changes in Sub-Saharan Africa. The contributors to this volume focus on the pressing problem of how actors in their everyday life, political and social action handle uncertainty. With the help of rich empirical material from different countries in Sub-Saharan Africa, the authors try to understand how actors react, manoeuver, organize and make their actions meaningful in an environment characterized by unpredictability and change. 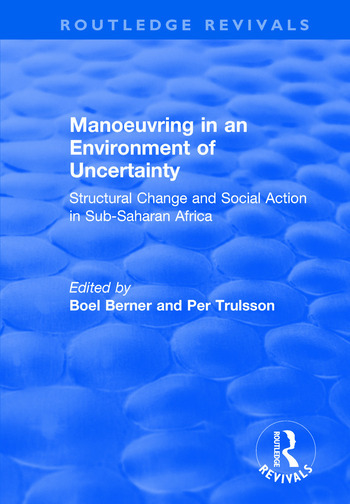 Contents: Theoretical Inroads: Structural change and social action in sub-Saharan Africa: an introduction, Boel Berner and Per Trulsson; Uncertainty in Africa: shifting paradigms and levels of analysis, Goran Hyden. Redefining Boundaries: The African nation state: an elusive challenge, Anders NÃ¤rman; Ethnicity and politics in Cameroon: a new kind of uncertainty in the 1990’s, Antoine Socpa; Naming and claiming: land-authorising strategies in post-independence Zimbabwe, Amanda Hammar. Individual and Group Strategies: Entrepreneurs as path-finders in processes of social change, Per Trulsson; Knowledge for sale? The politics of university education reform in Africa, with a Nigerian example, Said Adejumobi; The way of the bricoleur, Tanya Elder; Pastoralists Manoeuvring in the drought-ridden Sahel, Mette Bovin. Understanding African Uncertainties and Beyond: Everything can be negotiated: ambiguities and challenges in a time of uncertainty, Achille Mbembe; Manoeuvring in uncertainty: on agency, strategies and negotiations, Boel Berner. Index.